Doug Nassif's custom Royal Enfield café racer. 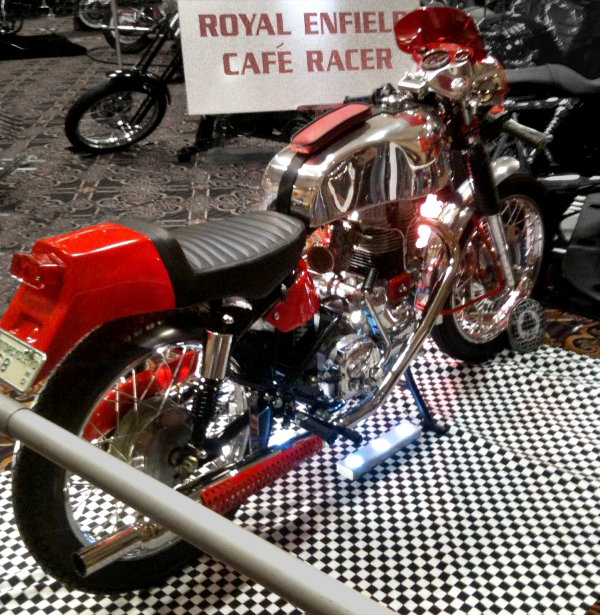 Doug Nassif is delighted that his customized Royal Enfield café racer won the sport division in the 2011 motorcycle show sponsored by the Freedom Riders Motorcycle Club of North Dakota March 20. The motorcycle turned out to be a pretty unique entry. "It was the only non-Harley or non-Japan bike in the whole place!" Doug writes. Doug is the proud owner of the 2008 Royal Enfield Bullet with the café racer kit, customized to his liking with the help of Scoots4u in Lakemoor, Ill.
Doug lives in Bismarck, N.D. His plan was to show the machine at 2011 Spring bike shows, then, when North Dakota finally warms up, "ride the thing." Scoots4u owner Bob Pilz is pretty unique, too. He bought many iron barrel Royal Enfield Bullets, creating a storehouse of potential donor bikes for projects like this.